The Temple in Jerusalem is a controversial subject. 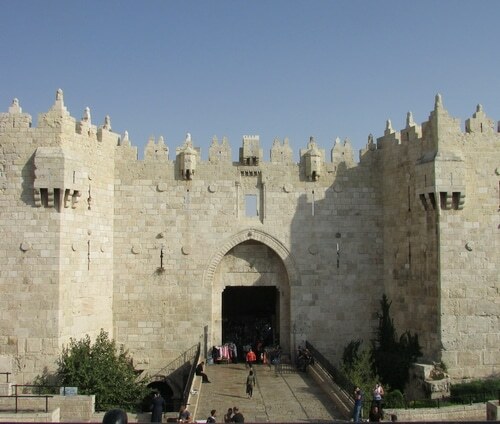 As I write this on October 18th, 2016, Unesco, the United Nation’s Cultural and Heritage body, ratified a declaration denying the Jewish connection to Jerusalem and the Temple Mount, including the Western Wall, ignoring 3,000 years of documented history. 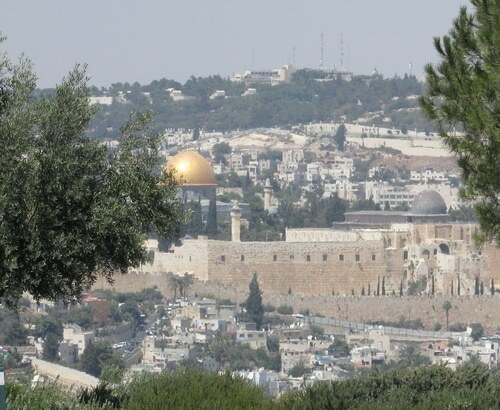 In the place of the Jewish connection to the Temple and the City of Jerusalem, the Unesco vote put forward the Muslim connection to the Al-aqsa Mosque and the Dome of the Rock. To gain an understanding of the current issues it’s helpful to understand the instructions given for the Tabernacle, Solomon’s Temple, and the Temple of built by Zerubbabel and renovated by Herod. 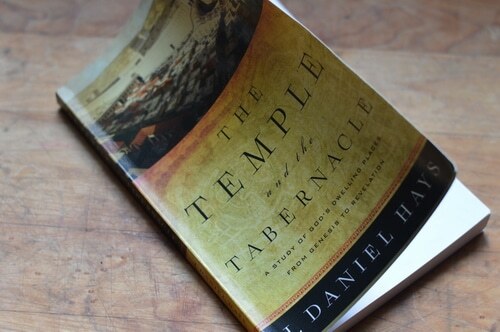 J. Daniel Hays’ book, The Temple and the Tabernacle, a Study of God’s Dwelling Places from Genesis to Revelation (Baker Books: Grand Rapids, Michigan, 2016) is thoroughly research and impressive in its scope, and is a helpful foundation for this understanding. Hays begins at the creation account with the garden of Eden as a pattern for the Tabernacle and the Temple. 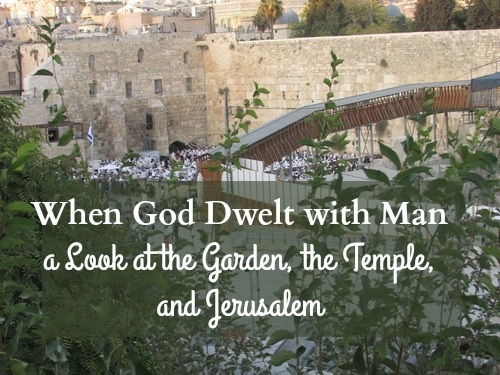 In the garden God dwelt with man. Man and woman talked to God every day as they walked together in the garden. You knew that there was a good reason to plant a garden, right? However, after Adam’s sin, the man and his wife were kicked out of the garden. An angel with a flaming sword was placed at the entrance on the East side of the garden to prevent man from coming back into the garden to eat from the Tree of Life. I never realized before that in order to come to the Creator God, man was required to turn his back to the rising sun, facing west. From the very beginning the choice has been between worship of the sun or worship of the One who created the sun. Dome of the Rock, looking east toward the Mount of Olives. Photo credit: Sarah Dalziel, used with permission. When the tabernacle was built from the instructions in the Torah, the only doorway faced east. Again in order to come to the entrance of the tabernacle with offerings and sacrifices, man must turn his back to the rising sun and face toward the west, acknowledging the Creator God. Solomon’s temple copied the orientation of the Tabernacle with the entrance facing east toward the Mount of Olives. Zerubbabel’s temple also faced east, so that a person entering must place his back toward the rising sun in order to enter and make offerings. But the temples are not simply a bigger more solid version of the Tabernacle. There are significant differences. 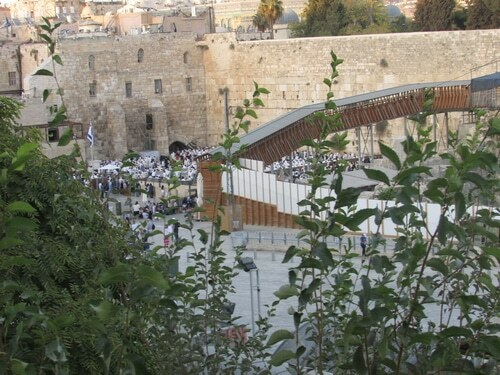 The Tabernacle is a moveable tent that leads the nation of Israel through the wilderness. In each camp, the Tabernacle is meticulously set up. The daily, monthly, and annual sacrifices are done in a very small space, that is only accessible to the priests and the Levite class. The Western Wall on Yom Kippur 2016. Photo credit: Sarah Dalziel, used with permission. In the building of the Tabernacle, minute details are given in the measurements and placement of each piece of furniture. The account states that the workmen are anointed by God to accomplish their tasks. The workman are named. The Tabernacle is divided into two parts which include the Holy Place and the Most Holy Place. The worshippers did not enter the tabernacle but remained on the outside. The tabernacle held the very presence and glory of God. There were times when the presence was so strong within the tabernacle that even the priests could not enter it. The tabernacle moves around even after Israel enters Canaan, and is the centre of worship for almost 500 years. Solomon builds his temple around 1000 BCE. The account doesn’t name the workmen, but says Solomon built it. The Temple is bigger and shinier than the Tabernacle. It includes courtyards and porches for the people to stand in when they bring their sacrifices. It also includes two large bronze pillars, Yakin and Boaz, that are not in the instructions given to Moses. 1 Kings 6, 7 offers a long description of these pillars. 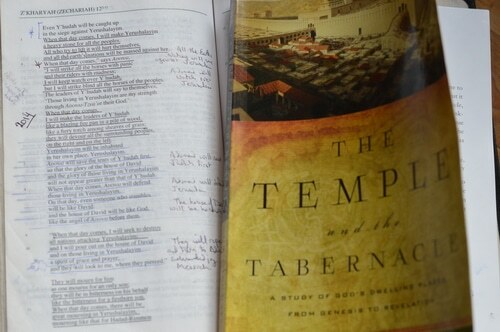 Hays interprets the building of Solomon’s Temple as a negative in the life of the community of Israel. It is built with conscripted labour, which Hays blames for the civil war and the rift between the 10 tribes of Joseph and the 2 tribes of Judah, after Solomon’s death. Instead of several craftsmen chosen and anointed by God for the work, Solomon appoints Huram, the son of a man of Tyre to oversee the building of the temple. The pieces for the temple are done in cast bronze. The biblical account devotes more space to this bronze work than it does to the furnishings inside the Temple. While God’s presence indwells Solomon’s temple, it comes with a warning, that obedience is required to maintain the presence with the people. In Ezekiel God shows the prophet the apostasy of the priests and his presence leaves the temple. While the Ark of the Covenant, where God dwells, is mentioned in both the Tabernacle and in Solomon’s Temple, the Ark disappears prior to the destruction of the Temple by Nebaccanezer. The Temple is rebuilt by Zerubbabel, a descendent of David, in 536 BCE, and dedicated in 515 BCE. Zerubbabel’s temple is more modest than Solomon’s Temple. It has no ark of the covenant. The presence of God is not mentioned to dwell there as it did in the tabernacle and in Solomon’s temple. It seems that there is nothing at all in the Holy of Holies in Zerubbabel’s temple. Herod the Great adds on to Zerubbabel’s temple, several courtyards and porticos. Specifically the court of the women is added and the court of the nations. Prior to this women came with their families and worshipped together with their menfolk and children, but in Herod’s temple women are separated from men, and limited to the porticos that surround the court of the women. The actual courtyard is used for other things, and women can’t stand there. Herod’s Temple is so impressive it is considered a great wonder in its time, surrounded by large pillars, store rooms and colonnades. The disciples marvel at its grandeur and Jesus uses it as the starting point of his Olivet discourse, when he warns them that “not one stone will be left upon another”. 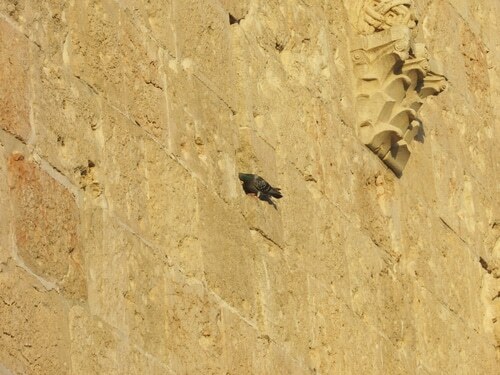 Wall around the old city of Jerusalem. Photo credit: Sarah Dalziel, used with permission. The New Testament foretells the destruction of the Temple in 70CE. In a shift of theology, Paul instructs that the believer is now the Temple of God and is indwelt by the Holy Spirit. I enjoyed this book. I learned a lot. 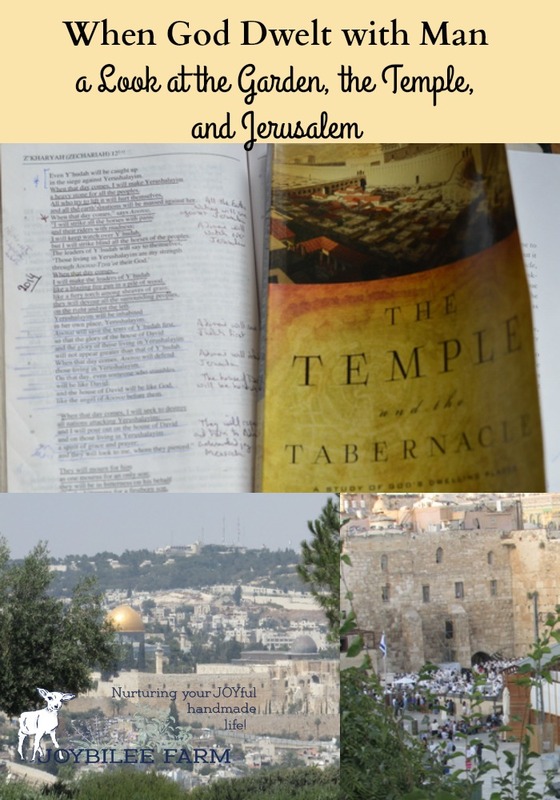 It is a book that would bless serious Bible students, pastors, and lay people who love Israel and want a better understanding of the Temple Mount controversies. Understanding the story of the Temple helps a person understand the Jewish claim today, to the Jerusalem and the Temple Mount. It also enhances your understanding of the Bible and the allusions made in the New Testament. Prophesy students would also have their understanding of significant prophesies enlightened by the information in this book. But I believe the real value of this bookis the call to return to the garden. In the garden there was the daily presence of God walking with the man and his wife. This is what we need to bring healing and to restore our JOY. Turn west and enter in. Disclaimer: I received a review copy of this book from Baker Books. This review represents my honest opinion of the book. This post contains affiliate links. With Christ, in His perfection of the law, as our atonement, the beautiful law of the Eternal is to be life to us. It lasts for ever, and brings us healing. We do, indeed, have two choices – rely on worldly things or rely on the Eternal. We are to have none beside Him – the Song of Moses, Deuteronomy chapter thirty – two.